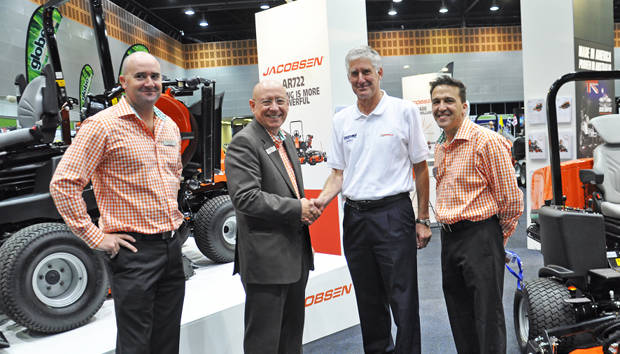 Gaffney Machinery Pty Ltd, with branches in Somerset and Longford has been appointed the Jacobsen distributor for Tasmania, further increasing the product offering across Australia. Established in 1961, the company employs over 20 people at its two branches strategically located in the north and northwest of Tasmania. With over 50 years of unbroken service representing major brands in the agricultural machinery sector Gaffney’s has built a reputation for service support that is second to none in the area. In 2001, long serving staff members Greg Cahill, Brendon Franks and Alana Edmunds became shareholders, guaranteeing the longevity of the business. With 90 years of experience in the turf maintenance industry, Jacobsen has built a legacy of precision craftsmanship, legendary quality of cut and unmatched expertise. Dedicated solely to delivering perfectly groomed turf, Jacobsen equipment is used on some of the finest golf courses, sports fields and other formal turf areas across the United States and the world, through an extensive distribution network and the international Ransomes brand. More information can be found at www.jacobsen.com.